Next In Line For The TSA? A Thorough 'Chat-Down' Boston's airport will be the first in the U.S. to require all passengers to go through behavioral profiling screening, where officers look for involuntary micro expressions as a reaction to casual questioning. It's intended to find high-risk passengers, but some doubt that the TSA is up to the task. A TSA employee being trained in behavioral pattern recognition watches passengers in line at Boston's Logan International Airport in 2010. This week, Logan will become the first U.S. airport to require every passenger to go through behavioral profiling. Boston's Logan International Airport will become the first in the nation this week to require every single traveler to go through a quick interview with security officials trying to spot suspicious behavior. Until now, the so-called behavioral profiling — used successfully in Israel — has been used only sporadically in U.S. airports. As the system expands, so are questions about how behavioral profiling works, and how effective it might be in the U.S. Unlike the usual security pat-down, the profiling process is what you might call a "chat-down." A blue-uniformed Transportation Security Administration (TSA) officer begins with a friendly "Hi, how are you?" and then spends a minute or two peppering passengers with basic questions like where they're going, for what and for how long. Some travelers may not even speak English, but the behavior detection officers care less about answers than affect. "We are looking for behaviors that are out of the norm — some kind of indicators of intent to cause a problem," says George Nacarra, federal security director for the TSA at Logan. Nacarra says there is a long list of hints or "tells" that can out a bad guy planning to do bad things: "The movement of the eyes, perspiring in a cool environment, the Adam's apple movement. ... I can't be more specific because they are somewhat classified," he says. Nacarra says he doesn't want the list to end up in some terrorist's training manual. But experts say most of the behaviors officers are looking for are involuntary physiological reactions that a human being would not be able to repress. "That's like saying don't have a heartbeat," says Marc Salem, who has made a career as a consultant to law enforcement — and as a performer. He's so good at reading peoples nonverbal cues, you'd think he was reading your mind. He offers to demonstrate, even over the phone. "Pick a two-digit number, between 50 and 100, both digits even," he says. He explains that he can't guarantee 100 percent success, since he won't be able to read all of the clues he usually gets from face and body language. On the phone, his only clues are things like voice quality, hesitation, pacing and breathing. "Say nothing aloud," he says. "I'm just going to work off of breath. Hold your mouth next to the phone," and he begins to count as fast as he can from 50 — until he stops dead at 68. "[It's] 68!" he announces. He says he heard a faint tongue click right when he said the number. It's subtle, Salem concedes, but he was listening for something like that; he knew I would try to control my breathing, since he mentioned he was listening for that. "If you hold up something, if you clog one channel of information, it's got to come out somewhere else," he says. In fact, the TSA has a list of about 35 things they're listening and looking for, including on your face. Experts say certain emotions result in specific facial expressions that are universal, like smiling when happy, or raising and scrunching your eyebrows when scared. A really good poker face could make that less obvious, but the facial muscles will still move ever so briefly. Paul Ekman, a psychologist and pioneer in the study of facial expressions, as well as a longtime TSA consultant, calls it a "micro expression," and he says officers can easily be trained to spot that. Paul Eckman explains how involuntary, universal facial expressions reveal underlying emotions. "All we're doing is training your eyes to be able to grab very, very fast expressions," says Ekman, who runs training for law enforcement and others through his company, Paul Ekman Group, LLC. "This is ... how football players learn to get peripheral vision and to spot people who are going to try to tackle them. It's the same kind of thing; we are training a visual skill." The tricky part, however, is sorting out whether a passenger is just nervous about traveling, for example, or about the bomb in his shoe. And while the Israelis seem to have mastered that, experts say Americans face unique challenges. For starters, there's greater sensitivity in the U.S. than in Israel to racial and ethnic profiling. And secondly, there are so many more travelers; TSA officers will have to screen many more passengers in much less time. "Maybe they'll turn out to be great at it, but I wouldn't say they go so far as to inspire a lot of confidence," says Glenn Reynolds, a law professor at the University of Tennessee and a vocal critic of the TSA. Reynolds says behavior detection officers in the U.S. tend to be lower ranking and less educated than the Israelis, and may not be up to the task. "It would be like deciding that you're suddenly going to do brain surgery in every minute clinic around the country," he says. "You can't just retrain those people who may be perfectly good at dealing with poison ivy and sinus infections to suddenly do brain surgery. I mean, it's just a different level." It would be like deciding that you're suddenly going to do brain surgery in every minute clinic around the country. You can't just retrain those people who may be perfectly good at dealing with poison ivy and sinus infections to suddenly do brain surgery. But TSA officials say their goal is not so much to identify terrorists in 30 seconds, but to just sort out higher-risk passengers for more screening. "You don't have to find the needle in the haystack," says Mark Frank, professor of communications at the University of Buffalo, who is working with TSA on its behavior detection programs. "You only have to find the section of the haystack where the needle may be." 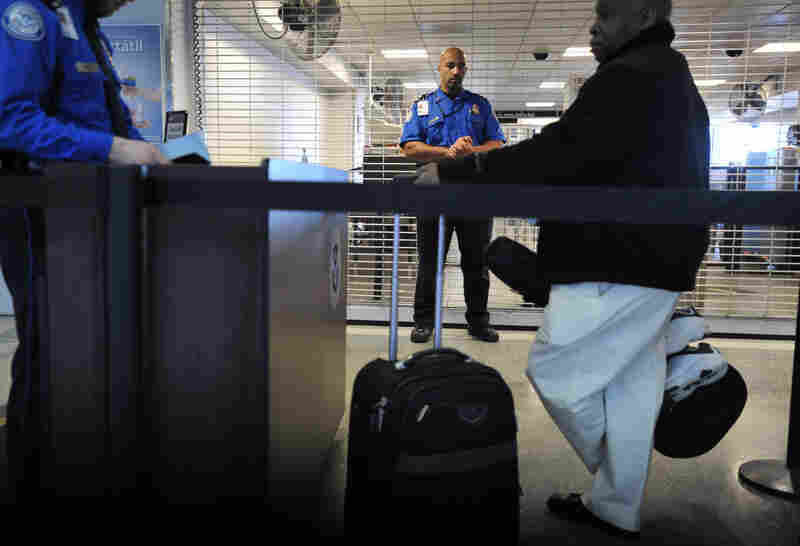 The TSA's George Nacarra says officers who've been doing this sporadically have already proven themselves, by rooting out untold drug smugglers and fugitives, for example. And all officers will get more training before they are assigned to the expanded screening program. "We are not making any assumption that we can do this," Nacarra says. "It may be that we have to seek other qualifications in our workforce, but that's the reason for a pilot test like this. This is just the beginning." Ultimately, Nacarra says, you have to try every tool you've got — both to find the bad guys and to deter them. As one expert put it, as long as the bad guys believe this works, that's half the battle.